Clinical responses were maintained from week 10 to week 20. Non-responders in the placebo arm from the first ten weeks received filgotinib 100mg in the second ten weeks and showed improvement in clinical remission during the second part of the trial. Overall, in the FITZROY study at 20 weeks of treatment, filgotinib demonstrated a favorable safety profile consistent with the DARWIN studies in RA. An increase in hemoglobin was also observed in FITZROY, without difference between filgotinib and placebo. No clinically significant changes from baseline in neutrophils or liver function tests were observed. Gilead initiated a Phase 3 trial (DIVERSITY) with filgotinib in CD in November 2016. The DIVERSITY Phase 3 trial investigates efficacy and safety of 100 mg and 200 mg filgotinib once-daily compared to placebo in patients with moderately to severely active disease including those with prior antibody therapy failure. Gilead will recruit approximately 1,300 patients from the U.S., Europe, Latin America, Canada, and Asia/Pacific regions. 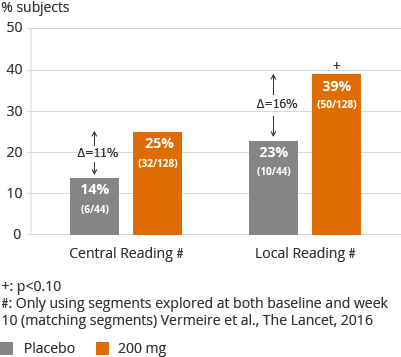 Men and women in the DIVERSITY trial will be randomized to receive placebo, 100 mg or 200 mg filgotinib. In the U.S., males may receive 200 mg if they failed at least one anti-TNF and vedolizumab, a monoclonal anti-integrin antibody marketed by Takeda. In March 2017, Gilead initiated two additional Phase 2 studies with filgotinib in Crohn's disease: small bowel and fistulizing Crohn's disease.